All of the French zone stamps for the state of Wurttemberg-Hohenzollern that were issued during 1949 were either commemorative postage stamps or commemorative semi-postal (charity) stamps. The set of two stamps above (Mi. #38-39, Sc. #8NB5-6) was issued on February 11 to publicize the 1948-1949 German Skiing Championships held at Isny im Allgau. The stamps, which were typographed on paper with the crosses and circles watermark, depict a view of Isny im Allgau and a skier and village. The stamps and souvenir sheet shown above (Mi. #40A-43A (Block 1), Sc. #9NB1-4, #9NB4a) were issued on February 25, 1949 to publicize the Red Cross, with the surtax going to the German Red Cross. 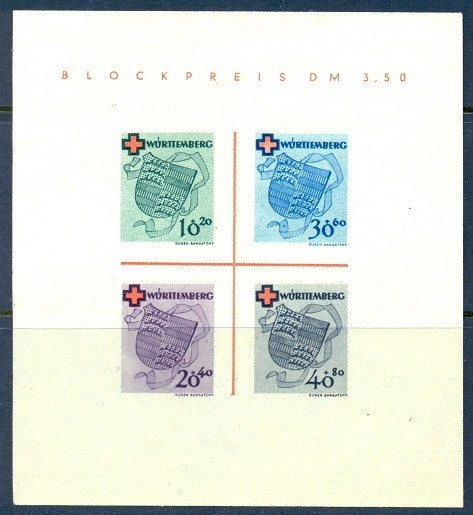 Each of the stamps depicts the coat of arms of the French zone state of Wurttemberg-Hohenzollern with a red cross above it. The souvenir sheets were issued imperforate and without gum. The set of stamps shown above (Mi. #44-46, Sc. #8NB9-11) was issued on August 12, 1949 to commemorate the 200th Anniversary of the Birth of Johann Wolfgang von Goethe. The three stamps depict various portraits of Goethe. The set of stamps above (Mi. #47-48, Sc. #9NB7-8) was issued on September 3, 1949 to commemorate the 100th Anniversary of the Gustav Werner Foundation. Both stamps feature a portrait of Gustav Werner. The surtax was to aid the foundation. Gustav Albert Werner (1809-1887) was a Protestant pastor and the founder of the "Bruderhaus" or "Brother House". The Brother House and later the Gustav Werner Foundation provided mentoring and educational opportunities to orphaned children. A similar organization in the United States is known as "Big Brothers of America". The set of two stamps in the image above (Mi. #49-50, Sc. #8N38-39) was issued on September 17 to commemorate the 100th Anniversary of German postage stamps. The 10 Pf. denomination depicts a mail coach of 1849 and the 20 Pf. depicts an airplane and a mail bus pulling a trailer of 1949. The two stamps in the image above (Mi. #51-52, Sc. 8N40-41) were issued on October 4 to commemorate the 75th Anniversary of the Universal Postal Union. Both stamps depict a posthorn and a World globe. At the beginning of October 1949, the state of Wurttemberg-Hohenzollern joined the newly established Federal Republic of Germany, and their separate stamp issues were replaced by those of the new West German republic.